Draft: 2006, Cleveland Indians, 10th rd. Paolo Alesandro Espino...Paolo and wife Leslie have a daughter, Alana…graduated from Pendleton (FL) High School, where he was a teammate of current Brewers Spanish translator Carlos Brizuela. Saw his 1st major league action, posting no record with a 6.00 ERA (16 ER/24.0 IP) in 12 G/2 GS for Milwaukee and Texas…had 5 total stints in majors…gave up 7 HR as he averaged 2.6 HR allowed per 9 innings…had 5.63 ERA (5 ER/8.0 IP) and 1.500 WHIP in 2 starts, and finished season with 10 relief outings: 6.19 ERA (11 ER/16.0 IP) and 1.313 WHIP…did not have any save chances…spent balance of season in Pacific Coast League, going a combined 5-2, 4.46 (39 ER/78.2 IP) in 17 G/14 GS for Colorado Springs and Round Rock at Triple-A. MILWAUKEE // Posted a 6.11 ERA (12 ER/17.2 IP) in 6 G/2 GS spanning 4 stints with the Brewers in 1st ML action: 5/19, 6/8, 6/13-7/2, 7/28-31…made MLB debut in start for MIL on 5/19 at CHC (ND, 4.0 IP, 5 H, 3 R-2 ER)…1st outing came at age 30 years/129 days, oldest to debut with a start in 2017 and oldest since Cubs' Tsuyoshi Wada (33.137) on 7/8/14 at CIN (G2)…next game was also a start on 6/8 vs. SF (ND, 4.0 IP, 3 R-ER), then final 4 outings were in relief, last on 7/2 vs. MIA…was optioned to Colo. Springs for a final time on 8/1 and designated for assignment on 8/22. Had a 3.30 ERA with Syracuse in the International League, lowest since 2012…surpassed 150 innings for a 2nd straight season, 2nd-highest total of his career (152.2 IP). Posted a career-best 155.2 innings at AA and AAA in the Washington system. Combined for career-best 1.036 WHIP in top 2 minor league levels in Washington system…also career-best 4.83 SO/BB ratio. Career-best 141 strikeouts across top 2 levels in the Cleveland organization. Shuttled between Akron and Columbus for the 3rd straight year, starting a career-best 22 games. His 1.047 WHIP was 2nd-best in a season in his career…also career-low 2.77 ERA. Selected an Eastern League All-Star at Akron. Led Carolina League in ERA (2.59) and WHIP (1.04) in 22 G/21 GS with Kinston. Spent majority of season in Lake County bullpen after opening campaign in the Kinston rotation..
April 2, 2019 RHP Paolo Espino assigned to Fresno Grizzlies. January 27, 2019 RHP Paolo Espino assigned to Dominican Republic. 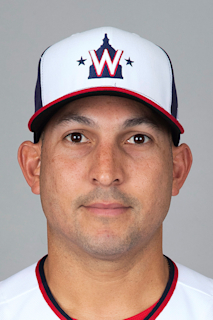 January 16, 2019 Washington Nationals signed free agent RHP Paolo Espino to a minor league contract. November 2, 2018 RHP Paolo Espino elected free agency. October 30, 2018 RHP Paolo Espino assigned to Toros del Este. September 3, 2018 Paolo Espino roster status changed by Colorado Springs Sky Sox. August 26, 2018 Colorado Springs Sky Sox placed RHP Paolo Espino on the 7-day disabled list. June 18, 2018 RHP Paolo Espino assigned to Colorado Springs Sky Sox. June 3, 2018 RHP Paolo Espino assigned to Helena Brewers from Colorado Springs Sky Sox. May 15, 2018 RHP Paolo Espino assigned to Colorado Springs Sky Sox. May 1, 2018 Milwaukee Brewers signed free agent RHP Paolo Espino to a minor league contract. April 19, 2018 Round Rock Express released RHP Paolo Espino. January 29, 2018 RHP Paolo Espino assigned to Round Rock Express. December 26, 2017 RHP Paolo Espino assigned to Gigantes del Cibao. December 21, 2017 Texas Rangers signed free agent RHP Paolo Espino to a minor league contract and invited him to spring training. November 6, 2017 RHP Paolo Espino elected free agency. October 14, 2017 RHP Paolo Espino assigned to Toros del Este. October 10, 2017 Texas Rangers sent RHP Paolo Espino outright to Round Rock Express. September 1, 2017 Texas Rangers recalled RHP Paolo Espino from Round Rock Express. August 26, 2017 Milwaukee Brewers traded RHP Paolo Espino to Texas Rangers for cash. August 26, 2017 Texas Rangers optioned RHP Paolo Espino to Round Rock Express. August 23, 2017 Milwaukee Brewers designated RHP Paolo Espino for assignment. August 2, 2017 Milwaukee Brewers optioned RHP Paolo Espino to Colorado Springs Sky Sox. July 28, 2017 Milwaukee Brewers recalled Paolo Espino from Colorado Springs Sky Sox. July 3, 2017 Milwaukee Brewers optioned RHP Paolo Espino to Colorado Springs Sky Sox. June 13, 2017 Milwaukee Brewers recalled Paolo Espino from Colorado Springs Sky Sox. June 9, 2017 Milwaukee Brewers optioned RHP Paolo Espino to Colorado Springs Sky Sox. June 8, 2017 Milwaukee Brewers recalled Paolo Espino from Colorado Springs Sky Sox. May 20, 2017 Milwaukee Brewers optioned RHP Paolo Espino to Colorado Springs Sky Sox. May 19, 2017 Milwaukee Brewers selected the contract of Paolo Espino from Colorado Springs Sky Sox. November 11, 2016 RHP Paolo Espino assigned to Colorado Springs Sky Sox. November 10, 2016 Milwaukee Brewers signed free agent RHP Paolo Espino to a minor league contract and invited him to spring training. November 7, 2016 RHP Paolo Espino elected free agency. October 20, 2016 RHP Paolo Espino assigned to Toros del Este. February 15, 2016 Washington Nationals invited non-roster RHP Paolo Espino to spring training. September 29, 2015 RHP Paolo Espino assigned to Caribes de Anzoategui. June 5, 2015 Syracuse Chiefs activated RHP Paolo Espino from the temporarily inactive list. May 31, 2015 Syracuse Chiefs placed RHP Paolo Espino on the temporarily inactive list. May 29, 2015 RHP Paolo Espino assigned to Syracuse Chiefs from Harrisburg Senators. May 25, 2015 RHP Paolo Espino assigned to Harrisburg Senators from Syracuse Chiefs. May 24, 2015 RHP Paolo Espino assigned to Syracuse Chiefs from Harrisburg Senators. April 7, 2015 RHP Paolo Espino assigned to Harrisburg Senators from Syracuse Chiefs. October 9, 2014 RHP Paolo Espino assigned to Caribes de Anzoategui. August 31, 2014 RHP Paolo Espino assigned to Syracuse Chiefs from Harrisburg Senators. July 27, 2014 Harrisburg Senators activated RHP Paolo Espino from the temporarily inactive list. July 22, 2014 Harrisburg Senators placed RHP Paolo Espino on the temporarily inactive list. April 10, 2014 Washington Nationals signed free agent RHP Paolo Espino to a minor league contract. March 27, 2014 Chicago Cubs released RHP Paolo Espino. February 28, 2014 RHP Paolo Espino assigned to Chicago Cubs. November 18, 2013 Chicago Cubs signed free agent RHP Paolo Espino to a minor league contract. November 18, 2013 RHP Paolo Espino assigned to Iowa Cubs. November 4, 2013 RHP Paolo Espino elected free agency. October 9, 2013 RHP Paolo Espino assigned to Caribes de Anzoategui. August 9, 2013 RHP Paolo Espino assigned to Columbus Clippers from Akron Aeros. July 9, 2013 Paolo Espino assigned to Akron Aeros from Columbus Clippers. July 5, 2013 Paolo Espino assigned to Columbus Clippers from Akron Aeros. July 3, 2013 Paolo Espino assigned to Akron Aeros from Columbus Clippers. May 27, 2013 Paolo Espino assigned to Columbus Clippers from Akron Aeros. March 4, 2013 RHP Paolo Espino assigned to Cleveland Indians. November 24, 2012 RHP Paolo Espino assigned to Caribes de Anzoategui. May 19, 2012 Paolo Espino assigned to Akron Aeros from Columbus Clippers. May 12, 2012 Paolo Espino assigned to Columbus Clippers from Akron Aeros. May 5, 2012 Paolo Espino roster status changed by Akron Aeros. April 4, 2012 RHP Paolo Espino assigned to Akron Aeros from Columbus Clippers. March 12, 2012 RHP Paolo Espino assigned to Cleveland Indians. October 12, 2011 RHP Paolo Espino assigned to Tiburones de La Guaira. August 14, 2011 Paolo Espino assigned to Columbus Clippers from Akron Aeros. August 3, 2011 Paolo Espino assigned to Akron Aeros from Columbus Clippers. July 15, 2011 Paolo Espino assigned to Columbus Clippers from Akron Aeros. June 1, 2011 Paolo Espino assigned to Akron Aeros from Mahoning Valley Scrappers. May 26, 2011 Paolo Espino assigned to Mahoning Valley Scrappers from Akron Aeros. April 17, 2011 Paolo Espino assigned to Akron Aeros from Columbus Clippers. March 30, 2011 RHP Paolo Espino assigned to Cleveland Indians. August 3, 2010 Paolo Espino assigned to Columbus Clippers from Akron Aeros. April 8, 2010 Paolo Espino assigned to Akron Aeros from Kinston Indians. May 8, 2009 RHP Paolo Espino assigned to Kinston Indians from Lake County Captains. April 28, 2009 Paolo Espino assigned to Lake County Captains from Akron Aeros. April 25, 2009 Paolo Espino assigned to Akron Aeros from Lake County Captains. July 28, 2006 Cleveland Indians signed RHP Paolo Espino.